Ever since we went camping in the Uinta's with our friends this summer, Tom has had a little dream of owning 4-wheelers. Since we've planned to eventually buy a trailer anyway, this meant we'd need a way to haul the 4-wheelers too. 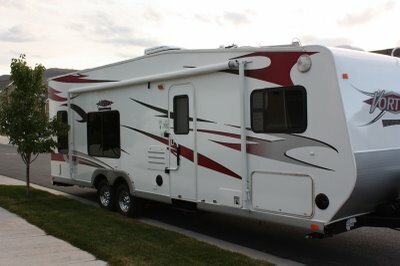 Thus, the idea of buying a toy-hauler emerged. The inside is quite nice. In the back there are 2 drop down queen beds. 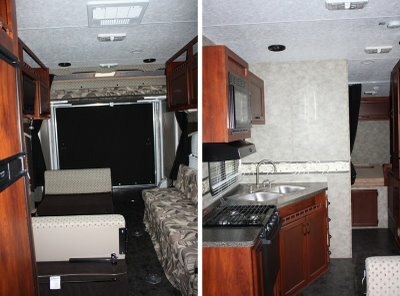 Then the dinette and couch fold out to beds, and when we pull the 4-wheelers in, they completely fold out of the way. (The back drops down as a ramp.) In the front there is another queen bed and the kitchen and bathroom. So, maybe I'm a pushover, but I do admit I like it a little, and I'll be looking forward to using it once it is back up here when Tom's job is done, around April we hope.